I am an investigator in Alaska seeking anyone who has knowledge of cases similar to the one described below. A 44 year old woman was walking her daughter's horses from a pasture back to their home. She always walked the horses, she didn't ride them. She had to walk them along a two lane highway. The horses are described as calm and fairly well trained. One was a 20+ year old mare and the other was a two year old mare (foal to the 20+ year old). Both had on halters and lead ropes. The horses were used to traffic and this daily routine. The woman was found lying unconscious appx. 8 feet off the highway on the side road leading to their home. The two horses were grazing nearby. The woman died several days later from brain injuries sustained from being struck on the right rear side of the head by something heavy and blunt. There were no significant open wounds so it is unlikely she was kicked in the head with a hoof. Other types of accidents (such as being struck by a vehicle) are unlikely. It has been suggested that one of the horses may have thrown it's head and struck the woman's head. Has anyone seen this type of injury before from a horse throwing it's head and striking a person's head? Yes, the woman could very well have been struck on the head by either of the horses. Yes, it is possible that she could have been head butted. Or she could have been struck by a hoof (front or rear) in any number of scenarios especially while leading TWO horses. Two-year-old horses are relatively immature and are easily capable of acting up under even the most familiar circumstances and striking with a front hoof while rearing or kicking. And older horses will often kick at another horse that is angering it or drawing closer than it feels it should. The absence of significant open wounds in the victim would not eliminate a kick. Many kicks do not leave open wounds. I have been involved with horses for over 50 years and have seen pretty much all kinds of injuries in a wide variety of circumstances. I am considered by many to be an expert in these matters. 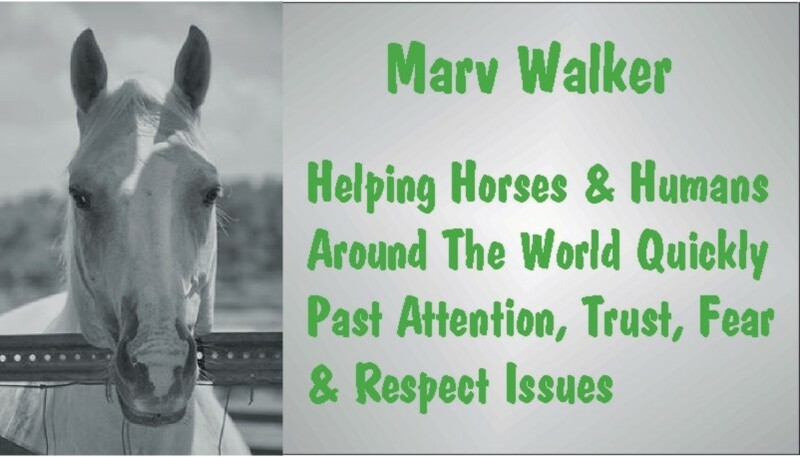 I have a high-traffic web site, http://MarvWalker.com that is accessed by people from around the world having problems with their horses. I continually stress that horses are the most dangerous animals on earth. If you are involved with horses it is NOT a question of *if* you be injured but *when* and those injuries will range from almost unnoticeable contusions and abrasions to death. I myself have been severely injured by horses on several occasions. I have personally known people who were killed or vegetated by them. Barring any other evidence, I certainly would accept one of the horses caused the victim's fatal injuries. Many thanks for taking the time to respond and share your experience and expertise. I was hoping to get responses from some folks such as yourself. I will be passing your information on to the family and I believe it will help them. If you have read much of my stuff or been around me working horses you have heard my mantra: "If you are involved with horses, YOU WILL BE INJURED. It is NOT a question of IF but WHEN and those injuries range from hardly noticeable to death." I personally have known people who have been killed by horses and some who have been, for all intents and purposes, vegetated. I myself have been nearly killed on a number of occasions. Use great caution and wear appropriate safety equipment (vest, helmet, boots) when working with horses.